In August 2017 NOAA one of the most important scientific organizations in the world released its latest report on our climate. It was very bad news. Greenhouse gases were the highest on record. Major greenhouse gases rose to new record-high values in 2016. The largest annual increase observed in the 58-year record. Global surface temperature was the highest on record. 2016 was half a degree warmer than the 30 year average. The 2016 temperature for land and sea was a record-high for a third consecutive year. Average sea surface temperature was the highest on record. Global sea level was the highest on record. The global average sea level rose to a new record high in 2016. Arctic sea ice coverage was at or near record low. The maximum Arctic sea ice extent (coverage) reached in March 2016 tied 2015 as the smallest in the 37- year satellite data record. The minimum sea ice extent in September was the second lowest on record. Extremes were observed in the water cycle. A general increase in the water cycle. Many parts of the globe experiencing major floods in 2016. Changes in the water cycle also leads to droughts. In any month in 2016 at least 12 percent of global land was experiencing at least “severe” drought conditions. The longest such stretch recorded. Tropical cyclones were above-average overall. 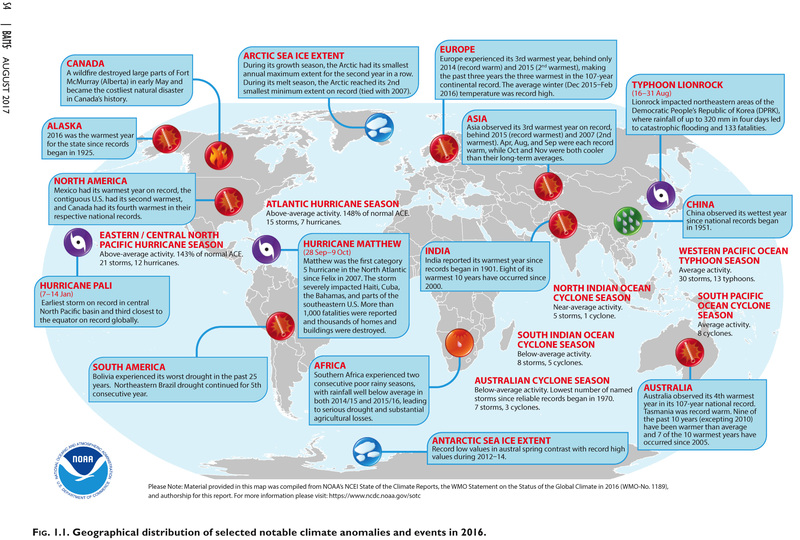 There were 93 named tropical cyclones across all areas in 2016. In the first article we looked at the news that predicted 152,000 deaths a year due to climate change in Europe by the end of the century. The figures for 2016 would mean that we would reach that stage in just 35 years if things keep getting warmer at the same rate as in 2016 and 2015 before it. But what is happening in Wales? We have already looked at how our summers seem to be changing but what can we find out from historical records? Use the bullet points to help you to write one or more sentences to explain the following titles taken from the NOAA report.